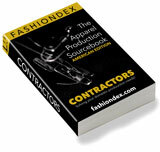 ID4U JACKETS WITH IDENTITY solving Coats & Jackets production and contracting needs. jackets. Also offer dye sublimation type decoration on shirts & jackets. as team shirts. Prototypes are offered for a minimal charge. Packages: CMT, samples, embroidery, screenprinting & dyeing. Factory Locals: Pennsylvania & Madras, India. Compare ID4U JACKETS WITH IDENTITY with all 17 listings in Coats & Jackets.